Nicki Hart – Creative Entrepreneur – Online portfolio for digital abstract artist, Nicki Hart. The virtual home of award-winning creative entrepreneur, teacher and designer Nicki Hart. 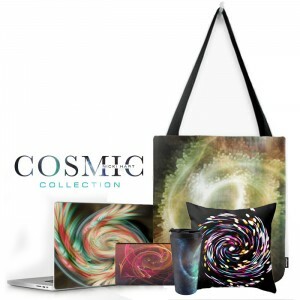 My Cosmic Collection of digital abstracts offers a sweet release from the corporate imagery I create every day. The process begins with a photograph of abstract light and then I manipulate this into a digital painting in Photoshop. My artwork was exhibited at the Los Angeles Center for Digital Art, Kadoya Gallery and featured on the cover of Advanced Photoshop Magazine’s 50th issue. Design Procademy by Digital Hart Studios started as a Youtube Channel called Design Like a Pro in 2009. Over the years I launched a series of videos covering how to design in InDesign & Photoshop. In 2016, I relaunched the website into a full on design education network. This network is a platform for video/audio tutorials that help designers engage their creativity and grow their skills. Flexibility in learning is key and designers can learn at their own pace by accessing a variety of free tutorials and template packs to get started. Design Like a Pro is still alive and well offering design tips & advice on Youtube. I also created over 20 two hour courses for Envato’s Tuts+. These courses cover everything from the basics in InDesign to full print projects such as resumes, books, package design and magazines. I’d love to hear from you! Send me a question or inquire about my creative services. I will get back to you as soon as I can. Usually within 24 hours. Welcome to my virtual hub where I share the many things I’m currently working on in the creative space. Before you dive in, here’s some fun facts about me. My first art program was Corel Photopaint. I started my design business when I was 22. I have flown a small plane. I bought my first computer when I was 12. I built my first computer at 32. I originally went to college for animation. I grew up on a ranch. I used to be incredibly shy until I took drama in high school. I love being outside with camera in hand. I launched into freelance work in 2007 and over time evolved into a running a full-time creative agency. Today my company, Multi-Designs, is an award-winning full service creative agency that currently works in a variety of mediums including web development, graphic design and marketing campaigns. Multi-Designs is your partner in stand-out brand development. We work with our clients to build a strong set of brand assets that translate into online and offline channels such as websites, social media, video commercials, book launch swag, direct mail, event invites, and more. GROW YOUR BUSINESS & ATTRACT MORE CUSTOMERS! Photography is an area that I originally didn’t plan on getting into. I took a class in college and fell in love! Not only has it helped me with my digital abstracts, I also became involved with shooting dance photography. Dance photos are a great way to learn how to use your camera and become a better photographer. Constant movement, changing lights and no flash make for a challenging set up. I am so grateful that I had the opportunity to photograph dancers on stage as well as promo and headshots for their performances. I also dive into landscape photography, portraits, and the occasional extra creative shots. Check out more of my photos on my Instagram and order a copy of my first photo book LUMINANCE that features 80 gorgeous pages of colorful landscapes featuring 21 full page panorama spreads.